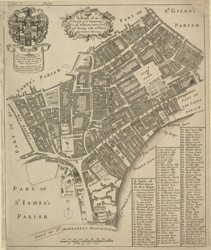 This plan of the parish of St Martins in the Fields shows the Banqueting House at Whitehall, the New Exchange on the Strand and Northumberland House. Near the top of the plate, the southern part of today's Leicester Square is indicated with the name of Leicester Fields. The equestrian statue of Charles I is depicted at Charing Cross. A pecked line marks the boundaries with the neighbouring parishes of St James and St Giles.